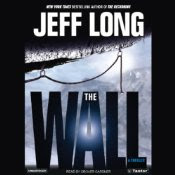 The Wall by Jeff Long was the first book I recorded for Tantor Media in 2006. It was nominated for an Audie Award in 2007. This was kind of startling to me because, as much as I enjoyed it, I hadn't been quite sure what to make of it when I was narrating it. Part action novel and part mystical ghost story, it doesn't fit snugly in either category. It's not that I want to pigeonhole books when I narrate them, or resort to a "stereotyped" read, but it helps to be able to determine what sort of audience the book will appeal to. This one was hard to pin down. The writing was excellent and the images were vivid enough to stay with me all these years. Today I got curious and looked up Jeff Long on Amazon, and I understand a bit more about him now. The Wall is in fact typical of his writing, which blends mystery, adventure and the supernatural in a way that defies easy categorization. Surprisingly, none of his other books are currently available in audio, which seems odd because the descriptions are appealing, the reader comments are strong and at least a couple of them have decent sales rankings. In fact, they look downright interesting. I may purchase a few for vacation reading.